Philanthropy and development – A new paradigm? Philanthropy is changing. Not in any radical or revolutionary way, but slowly, oil-tanker style. It is moving at a slow but steady pace, creating new structural trends, a new appreciation of learning through failure and a healthy opening up to the idea of collaboration. Some might call it a paradigm shift. Previously, foundations generally implemented time-bound, short-term projects, limited to a 12, 18 or 24 month timeframe, but today’s philanthropists are thinking much more systemically. The lexicon is changing as talk of long-term social investment programmes and inter-generational change gains traction. The difficulty of creating sustainable social value through short-term interventions is being recognised. Where once foundations took a ‘spray and pray’ or ‘scatter-gun’ approach disbursing multiple short-term grants to multiple third parties in multiple different sectors, today they increasingly focus. Historically, when the remit of foundations grew, too often it diluted their impact. Today, foundations are much more targeted and in some cases focusing on just a single issue with a view to eradicating it permanently, rather than simply mitigating it temporarily. Our model at Emirates Foundation is a case in point. From working with multiple different categories of beneficiaries and multiple themes with a large grant making portfolio, we now work on only one area – youth development. Moreover, rather than issue hundreds of grants each year to multiple third parties, we now run and manage our own programmes in-house. While grant making is still the norm, new financial instruments and new operational models are emerging. Social impact bonds are being watched closely by governments, social investors and even conventional ones. These performance-based investments pay out when successful social outcomes result in public sector savings. They are driving a new way of thinking about how social finance should be structured. With our new operational Venture Philanthropy model, where we focus on only one area, we are already seeing a difference in terms of measurable outputs – over 40,000 youth in the UAE have been impacted by our programmes. While often rightly reiterating the criticality of grants, foundations are now also looking at loan guarantees, debt and equity. As the world’s ‘wicked problems’ persist in their intractability, new financial instruments are needed to help scale up solutions. Community-specific innovation is not enough. The world needs large-scale initiatives to address large-scale problems. Extreme poverty still affects over one billion people on the planet despite over ten years of Millennium Development Goals (MDGs). Measurement is also coming to the fore. In the past, foundations tended to track inputs – the number of grants processed, the number of projects completed and the total spend. Today, they increasingly look at outputs and outcomes. What was the real impact of their efforts and did it last? Impact investors go further, demanding a tangible social (and often financial) return on their investments, forcing philanthropists to focus on real value creation rather than simply delivery and execution. New entrepreneurial ways of thinking are giving rise to new mechanisms of delivery with social enterprises at the fore. This hybrid model combines business principles such as efficiency, accountability and value creation with the traditional focus of social organisations. Social enterprise is also capturing the imagination of younger philanthropists disillusioned with the pure profit mantra of big business but convinced that philanthropy should be more results-driven and more transparent. Where once money was a key component, philanthropists now look to combine financial resources with technical ones. Many foundations are now very ‘hands-on’ in terms of delivery and much less comfortable with a transactional ‘cheque-writing’ model. Traditional dependence on single donors is being replaced by a drive for financial viability as a critical component of achieving long-term sustainable results. Where previously foundations may have kept their internal learning a closely guarded secret, today they are more inclined to share knowledge and insights. Logical frameworks and ongoing comprehensive evaluation are now seen as critical tools of improving internal learning and performance management. Foundations once averse to sharing ‘failure’ are now embracing it as a means of building capacity and credibility among investors, as a sign of track record and experience. These trends have not yet been institutionalised across the sector but are more and more prevalent in its literature, networks and events. Emirates Foundation’s annual philanthropy summit was dedicated entirely to this topic last year, themed ‘Philanthropy in Transition’. The OECD-hosted foundation network, NetFWD recently published a report reiterating these points. Entitled Venture Philanthropy In Development: Dynamics, Challenges And Lessons In The Search For Greater Impact,the report documents the transition of four global foundations (Rockefeller, Shell, Lundin and Emirates) from traditional philanthropy to Venture Philanthropy (also known as Strategic, Catalytic, or Enterprise-based Philanthropy). All four changed their business model with a view to deploying philanthropic capital more efficiently and creating more measureable social value. Not all are convinced of the new direction. Some traditionalists still challenge the idea of applying business acumen to creating social value. Even Boards are sometimes averse to applying the same principles of effectiveness and efficiency to a foundation that they would to a commercial entity. Such reticence continues to stymie the performance of the sector, allowing foundations to continue to report input rather than output and to gloss over things that didn’t work. However, the tide is turning as more and more philanthropists look for new models and new ways of delivering more impact and recognise that learning through failure is a powerful tool for driving greater accountability. At Emirates Foundation we publicly acknowledge that the sheer size and diversity of our earlier portfolio was significantly diluting our impact and ability to create sustainable outcomes. With our new operational Venture Philanthropy model, where we focus on only one area, we are already seeing a difference in terms of measurable outputs – over 40,000 youth in the UAE have been impacted by our programmes. Accountability and transparency lie at the heart of this new sectoral change. A step-change in both is moving philanthropy very much in line with global trends and the global demands of a twenty-first century where connectivity and a digital revolution kill opacity. It could also render the social impact of philanthropy much greater and more sustainable. Ultimately, foundations have a significant and growing potential to make a very strong contribution to some of the world’s most pressing social challenges. The sheer size of the philanthropic capital market means it can’t be ignored. With a new philanthropic paradigm that embraces efficiency and openness, perhaps emulated to some extent by the formal development sector itself, the MDGs and their reinvention, the Sustainable Development Goals that will replace them in 2015, might seem much easier to achieve. Clare Woodcraft-Scott is CEO of Emirates Foundation and oversaw its transition from grant-making to venture philanthropy. She has 20 years’ experience in sustainable socio-economic development as a practitioner, journalist and corporate executive. She was formerly Deputy Director of Shell Foundation which invests in social enterprises and earlier ran Shell’s social investment portfolio in the Middle East and North Africa. She previously headed Visa International’s public affairs in emerging markets and worked in Palestine for various development agencies. Images used courtesy of the Emirates Foundation. The Global Partnership – ready to broaden its mandate? Partnership, especially global, has to be a good thing. Many saw the Global Partnership for Effective Development Co-operation as a last-minute compromise reached at the 2011 Forum on Aid Effectiveness in Busan, Korea, but the Global Partnership’s first High Level meeting in Mexico on April 15-16 is the opportunity to prove its mettle. The question remaining is whether the Global Partnership can evolve into a leading element in the new global architecture on sustainable development or risks remaining just a slightly enlarged, post-Busan technical forum. The Global Partnership was conceived as a bridge, political as well as technical, between North and South. However for it to function, Western donors must find common cause with new development actors from an invigorated South such as China, India and Brazil. They must also respect country leadership from increasingly diverse recipient-partners ranging from lower-middle-income Vietnam to highly vulnerable Haiti. A Global Partnership linked ministerially to the G20, but also well co-ordinated with the UN, could be a win-win solution for development effectiveness. While the Global Partnership continues to find its feet, North and South are moving ahead on the Post-2015 Agenda, the stage beyond the Millennium Development Goals. Building upon his High-Level Panel and extensive consultations, the United Nations’ Secretary-General has proposed to build a consensus around two main objectives: the global elimination of extreme poverty and a set of sustainable development goals linking economic growth, social justice and environmental protection. The UN’s Open Working Group on Sustainable Development Goals is accelerating its work to frame these new goals later in 2014. An enhanced Global Partnership could play a more engaged role in building that consensus. A modest first step is already happening. The Global Partnership is informally extending beyond monitoring post-Busan performance to a role in helping frame the Post-2015 Development Agenda. But its leadership is still wary, focusing for now on their first High-Level Meeting. Today’s Global Partnership, with its tripartite ministerial leadership from the UK, Indonesia and Nigeria, works through a committee of 15 international ‘worthies’, selected, with what some might see as only partial legitimacy, to reflect views from different country groupings, international organisations, the private sector and civil society. It has a modest secretariat drawn from the United Nations Development Programme and the Organisation for Economic Co-operation and Development. This is all far from optimal for a global leadership role. The Partnership risks being left as a weak voice which will defer on strategic issues to traditional global governance fora such as the OECD Development Assistance Committee and the somewhat tired Bretton Woods Committees. Why not start, even if incrementally, to move towards a stronger role? To do this the Global Partnership needs a broader mandate. Busan already saw a shift in vocabulary from aid to development effectiveness. But development post-Busan must be understood more broadly to embrace trade and investment, intellectual property rights, climate change, global governance, etc. Encouragingly, that broader agenda is already entering Post-2015 thinking. In that same spirit the Global Partnership could be reformatted to include a broader–based, more representative ministerial-level body, perhaps as an enlarged steering committee on some sort of ‘constituency’ basis like the United Nations Open Working Group. This enlarged Ministerial membership might be broadly aligned with that of the current low-key development working group of the G20. 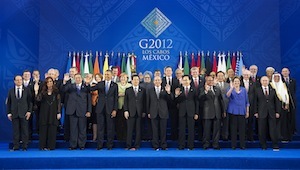 Conveniently, two of the Partnership’s Co-Chairs already sit as nations around the G20 table. None of this will be easy. The exact mechanics will need to be worked out within the Partnership and with the G20. The latter has its own challenges of legitimacy and flawed inclusiveness. It needs to quickly add a so-called fragile state. Conveniently one is already on the Global Partnership steering committee. Maybe more problematically, some influential New York voices within the G77 see Busan, thus the Global Partnership, as a ‘plot’ challenging the primacy of the UN. The G77 might prefer another body, the so-called High Level Political Forum, born at Rio+20 to work on the ‘how’ of Post-2015; however, it is also seen as stunted in terms of real power. The occasion for a first step could be the High-Level Meeting. Could ministers, especially those from countries already within the G20, in Mexico reach beyond the Global Partnership’s Development Effectiveness mandate to encompass the related challenges of merging Post-2015 Millennium Development Goals and new Sustainable Development Goals? Their formal agenda is important but somewhat technical, including post-Busan monitoring, future roles for the private sector, South-South co-operation, domestic resource mobilization and country-level implementation. This is not the stuff that usually grabs the attention of busy ministers. Moreover, there are more problematic issues that, although raised in Busan or the UN’s Open Working Group, may require a high-level political forum such as a G20 working group enriched with some Global Partnership ministers to build consensus or frame needed compromises. To move forward global leaders, from South and North, need to agree that there is no one ‘right’ global forum for decision-making or dialogue. Many ideas have their roots in the UN system; others emerge in fora such as the G20 or the Bretton Woods Institutions. None of these fora should have an exclusive right to global power and leadership. Indeed, in our multi-polar world enhanced inclusivity is ever more the institutional challenge. With this opportunity and also institutional ambiguity, maybe the Partnership even at this late hour might add an informal session in Mexico on its own mandate and future place in global governance? After all this will be first time the Global Partnership comes together as 100+ ministers at a meeting of old and new donors/partners and recipients. The session might be difficult, but still an invaluable exploration. Even to deal with its original Busan mandate, the Global Partnership needs greater legitimacy and empowerment. In a G20 context, North and South have learned to work as partners countering the global financial crisis. Extending that spirit to break the traditionalism within OECD and G77 circles might be a big boost towards the mindset needed for an effective Partnership. An important caveat is that some low-income, still aid-dependent, developing countries find an enhanced Global Partnership role a worrying concept. They fear it could distract traditional donors from maintaining the essential flow of conventional aid. Emerging Economies, the BRICS (that is, Brazil, Russia, India, China and South Africa), need to reassure them that this new broader development agenda will have space for both their own needs and those of the fragile states and LICs (Low Income Countries). A Global Partnership linked ministerially to the G20 will be institutionally a bold step. But, especially if it is also well co-ordinated with the UN, it could be a win-win solution for development effectiveness. Its first challenge could be to assist with the trouble-shooting and consensus–building essential for a successful outcome on the Post-2015 Agenda and its new Sustainable Development Goals. Beyond that, an enhanced ministerial leadership of the Global Partnership building upon its development effectiveness focus, could play a key role in pushing the G20 itself, still overly focused on the global financial crisis, towards a broader geo-political agenda, including issues of equitable and inclusive global development. This would hopefully finally displace any lingering G8 dreams of continuing exclusivity in global leadership. Voices of moderation and partnership in North and South should welcome and support this transition.